Finishing off a bowl of FVF in a GBD, to be followed by Meridian in a Savinelli. Peterson Irish Oak in a Norrding. Its given me three perfect bowls in a row. Old Ironsides in a Bari Don volcano. I've been smoking repeat bowls a lot, recently. Edit: Wife came home and kissed me--she approved of the 'stache note! SWR in a MM Missouri Pride.. Great smoke ..
Dunhill #965 in a Jacono. going to break in one of my homemade pipes with some frog mortin. 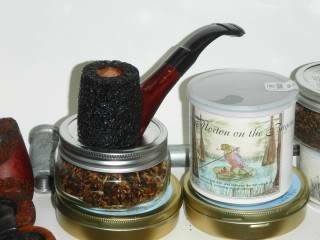 P&W Bohemian Mixture in a La Strada Pico.. Also Altadis J4 Mild Burley in a MM Patriot Cob..